Nearly five years after inaugurating service, Brazilian carrier Azul is capping off its rapid and highly successful growth with a planned initial public offering. Azul, led by former JetBlue founder and chief David Neeleman has quickly built up a position of strength in the domestic market place through a strategic acquisition it executed during 2012 of fellow Brazilian regional carrier TRIP. The combination helped Azul flesh out its network and build what it hopes is the necessary scale to withstand the changes its has witnessed in the Brazilian market place during its brief history, ranging from significant growth to a slowdown in traffic expansion as the country’s GDP has slowed during the last couple of years. The timing of the decision by Azul’s management to take the company public is interesting given that Brazil’s second largest carrier Gol recently warned that inflation in Brazil keeps rising and that it is uncertain if the country will attain its projected 2.5% GDP growth during 2012. But in making its case to potential investors Azul is attempting to make clear distinctions between itself and Gol by citing yield advantages and merger synergies of BRL200 million (USD96 million) to BRL300 million (USD144 million) during 2013. While Azul’s growth and its move to quickly build up its market share through the acquisition of TRIP is impressive, like its rival Gol it has racked up annual losses during 2011 and 2012, widening its loss year-on-year in 2012 by 63% to BRL171 million (USD82 million). Even as Brazil remains one of the still-blossoming opportunities for air travel growth, Azul’s losses coupled with the country’s tenuous economic forecast could dampen Azul’s prospects for going public. 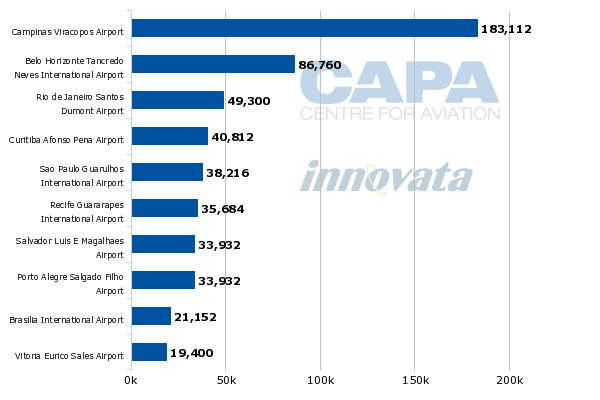 Azul estimates that as of 31-March-2013 it accounted for 29% of domestic departures within Brazil. 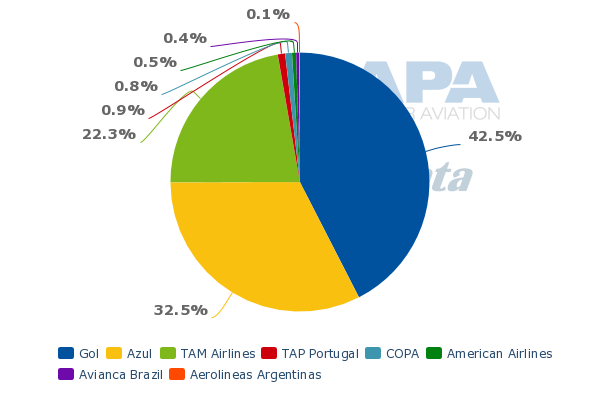 Previously, CAPA has estimated the Azul-TRIP combination represented approximately 17% of Brazil’s domestic traffic during 1Q2013. Gol’s realignment of its domestic operations during the last year helped to somewhat drive and sustain Azul’s rise to the third largest carrier in Brazil as Gol’s market share during 1Q2013 fell 6ppt year-on-year to 35% while Azul recorded a 3ppt increase. But the main driver in Azul’s rising prominence in the Brazilian domestic market is its purchase of TRIP, which Mr Neeleman at the time the tie-up was announced estimated as the equivalent of four years growth for Azul. The acquisition of TRIP supplied Azul with network breadth, allowing Azul to expand in the north and western regions of Brazil to round out its network. 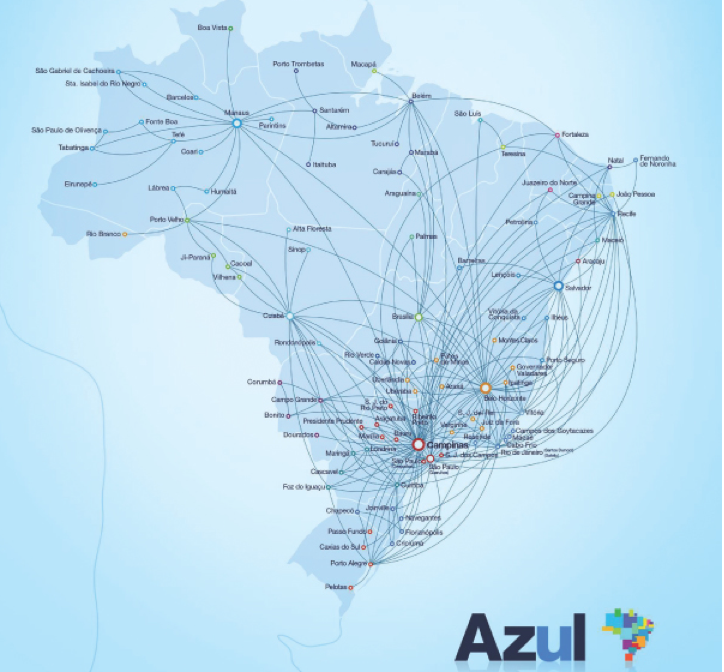 By acquiring TRIP, Azul was able to almost instantly add 46 destinations to its route network. Azul’s combining with TRIP broadened Azul’s reach in some of Brazil’s strategic markets, including Belo Horizonte, which is Brazil’s third largest metropolitan area. Prior to the acquisition Belo Horizonte was not included in Azul’s top 10 bases, but now is second in terms of seats on offer in the combined Azul-TRIP network. Presently Azul represents 33% of the seats on offer at Belo Horizonte, based on current schedules in Innovata (27-May-2013 to 2-Jun-2013). When it launched in 2008 Azul selected Campinas Viracopos as its base of operations. Campinas is located in Sao Paulo state, and roughly 90km from the very busy Sao Paulo Guarulhos. Azul benefits from the roughly seven million residents in the greater Sao Paulo metro area. The combination with TRIP also modestly increased Azul’s presence at Rio de Janeiro Galeo and Brasilia. Combined Azul-TRIP operate 118 aircraft (68 Embraer E-Jets and 50 ATR turboprops) on roughly 799 daily departures covering 232 routes in a network that encompasses approximately 103 destinations. In making a case to investors in its prospectus, Azul highlighted a key aspect of its competitive strength – on nearly 71% of its routes it is the sole airline. A key tenet of Azul’s business model since its launch almost five years ago was the calculus that it could stimulate demand in smaller regional markets among passengers that still travel by bus with the right sized aircraft. During 2011 it introduced smaller 70-seat ATR turboprops to complement its fleet of Embraer E-Jets as part of an expansion plan to serve markets too thin for the 100-plus seat E-Jets. But there appears to have been a subtle shift in Azul’s traveller composition as the carrier estimates during 2012 business travellers represented 60% of its passenger base while leisure customers accounted for the remaining 40%. The balance should help Azul withstand some of the seasonal cyclicality inherent in leisure travel. One of the reasons that Azul and TRIP were able to realise synergies from their merger relatively quickly was the highly complementary nature of their respective fleets. TRIP’s 46-48-seat ATR42 and 70-seat ATR72 turboprops joined ATR72 operated by Azul. TRIP’s 70-seat Embraer 175s and larger Embraer 190s complemented the 190s and 195s flown by Azul. Estimated synergies of the tie-up during 2014 are BRL300 million (USD144 million) to BRL400 million (USD192 million). Azul estimates its principal competitors Gol and TAM have, on average, 81% more seats on their aircraft, and the gap helped Azul achieve a 79% load factor for the three months ending 31-Mar-2013 with yield growth of 23% year-on-year. By contrast, loads at its rival Gol remained essentially flat during 1Q2013 as yields increased nearly 14%, which indicates some trade-off between loads and yields. Based on data from 1Q2013, Azul believes its fleet – with an average age of four years – produces a favourable BRL16,512 average trip cost compared with the BRL25,328 for Boeing 737-800s that comprise the bulk of Gol’s fleet. Azul also touts the labour efficiency of its fleet, noting its average full-time employees utilised per aircraft are 77 compared with 126 at Gol. Azul’s solid growth in yields year-on-year during 1Q2013 helped drive revenue growth by 105% for the quarter to BRL1.2 billion (USD578 million). But expenses increased nearly 96% to BRL1 billion (USD481 million) driven by a 118% increase in departures stemming from the acquisition of TRIP and currency fluctuations that also negatively affected the fortunes of LATAM and Gol. Azul also cited BRL408 million (USD196 million) in expenses related to its purchase of TRIP as a major contributor to its rise in 1Q2013 expenses. Excluding that amount Azul calculates its expenses would have risen 24% year-over-year. The company’s performance for FY2012 was also mixed as revenues grew 58% to BRL2.7 billion (USD1.3 billion), which was almost equal to the nearly 60% rise in operating expenses, which were BRL2.7 billion (USD1.3 billion) for the full year. Yields grew a respectable 21% but unit costs increased nearly 20%. Overall Azul racked up losses during FY2012 and FY2011 of BRL171 million (USD82 million) and BRL105 million (USD50 million), respectively, which is unlikely to instil a lot of confidence in potential investors. As of 31-Mar-2013, 54.5% of its expenses were denominated in or linked to foreign currency, which means the company has similar risk exposure to currency fluctuations as rivals LATAM and Gol. Management at Azul is attempting to take the company public during a time when traffic growth in the Brazilian domestic market is slowing after growing at an astounding rate of 23% in 2010 to a 6.8% increase in 2012. Traffic actually dropped by 1% in 1Q2013 mainly driven by capacity cuts ushered in by Gol and TAM to bolster yields that sagged for most of 2012. A positive is that the tempered capacity growth exhibited by Gol and TAM has resulted in a reasonably rational Brazilian domestic market place, where traffic is still expected to grow for FY2013, albeit at a much slower pace and likely below the level recorded during 2012. Azul has a more bullish view of the Brazilian market as it expects demand to grow between 7% and 9% during 2013, and plans to grow its capacity by 10% to 12% year-on-year. Perhaps Azul is trying to solidify its position as a member of the four leading airline groups in Brazil, joining LATAM, Gol and Avianca Brazil as a major force in the market place. Azul has built a network that is largely shielded from competitors and has built up a favourable mix of traffic to withstand typical troughs in demand. But Brazil’s economy remains somewhat of a wild card as Azul now courts potential investors. The country’s central bank has pledged to lower inflation during 2H2013, which could be an encouraging sign, but overall uncertainty will no doubt affect demand in the domestic market place. In sum, Azul is reportedly attempting to raise USD500 million at a time when Brazil’s explosive air traffic growth is now waning, and one of the country’s major carrier’s, Gol, is attempting to restore its lost profitability. Its planned uses of the proceeds are to fund expansion and pay off a BRL120 million (USD58 million) loan due in Jun-2014 that carries a 10% interest rate. The loan amount represents nearly 42% of the BRL289 million (USD139 million) in cash and equivalents Azul had on hand as of 31-Mar-2013. Azul’s mixed financial performance and the uncertainty of Brazil’s economic and air traffic growth during 2013 could coalesce to create challenges for Azul to attain the target amount it hopes to earn from its IPO. However, the company appears to have a solid foundation in place to remain a key player in Brazilian aviation for the long term. In the highly concentrated Latin American markets that will be more important than in many other regions. It is this feature that will be one of Azul's greatest attractions; for investors to wait till that potential is achieved would be to mean paying a much higher entry price. Mr Neeleman and his colleagues are throwing down that challenge to investors: to rise up on the tide with them - rather than waiting until the boat is well out to sea.